Loads of snow in our area this week! We don’t usually get very good packing snow, but we did in the first of this week’s snowstorms and there are lots of snowmen around town! I love it! Now we are having a little warm up… which is leading to a LOT of MELTING SNOWMEN! First we sang our Opening Song, where we said hi to the librarians, the snowmen and our Story Time friends. 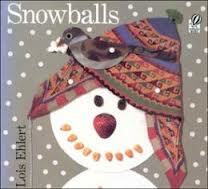 Adorable snow people are created out of a variety of foods, fabrics and natural items. 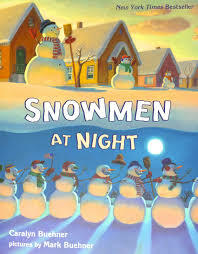 Cute story about snowmen, snow-women, snow-dogs, snow-cats, snow-kids! Of course the sun comes out at the end of the book, and you know what that means! And the mittens go on last so we can go outside to play! Here are the books we read during December!